Of course, the best it’s the last one because it’s runs on OSX “native” or at least in Wine. First of all you must download STO (the official one) from STO web or buy the DVD. Then you must use STO UMV to install it and update it. 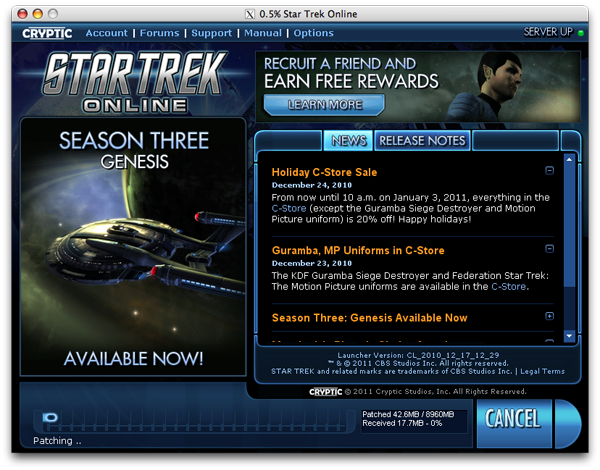 But after all (and making your account into Cryptic…) it can fail and STO doesn’t start. Don’t worry simply look at this tutorial and you will find how to start it without any problem. Now I must evaluate for a lifetime subscription or not.